I stood on the north side of the River Douro River last night, looking across at the port lodges in Vila Nova de Gaia on the opposite bank of the river. The lights reflected in the water gave a romantic glow to the early February scene, as if this truly was an early Spring evening. 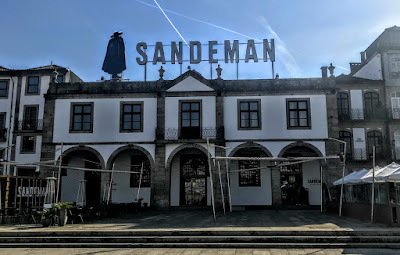 But I was struck too by how many of the Port lodges were English, with names such as Cockburn, Graham, Dow, Sandeman, Taylor and Offley, lighting up the roofs and the night sky in Porto. Long before ‘Brexit’ – indeed, over 300 years ago – British wine merchants were developing a niche place for themselves in the wine market, cornering the trade in wine exports from the Douro Valley to England after the wine trade with France had been closed off by war. As I looked at these names in the night sky last night, I wondered how a name like Offley could have travelled all the way from to Porto. 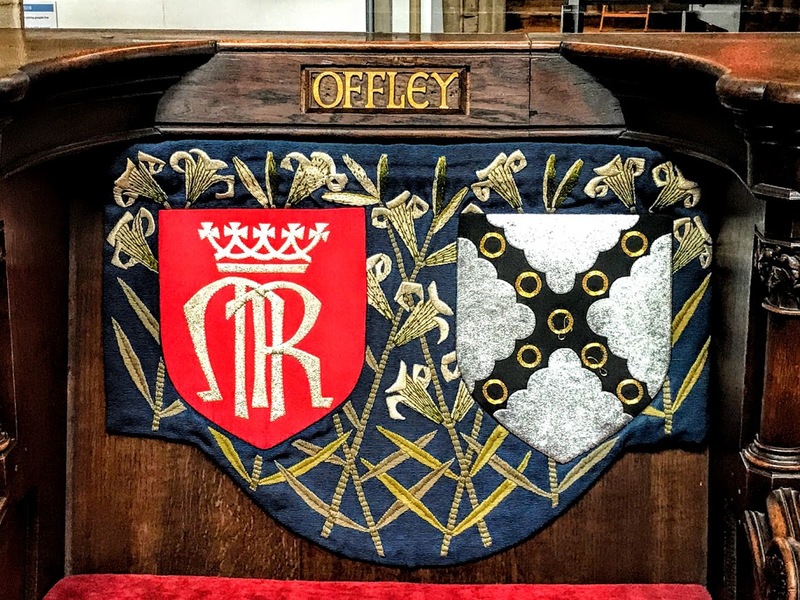 I was thinking not of Offaly, a county in the Irish Midlands, but of Offley, a small place in Staffordshire that gives its name to a prebendal stall in Lichfield Cathedral and that also has a remote and distant, if not obscure, connection with the Comberford family. The Lichfield Mercury offered me my first opportunity to begin a lengthy career in journalism and to start writing in history. It was so interesting to be reminded in Porto last night of an early connection with Lichfield at the same time as I was wondering whether the Port wine trade here had a connection with Lichfield Cathedral, with the Comberford family or with Staffordshire. High Offley is a small village and civil parish in Staffordshire, three miles south-west of Eccleshall and about a mile west of the village of Woodseaves, both on the A519. The symbol of the crowned inter-twined letters MR on the stall of the Prebendary of Offley in Lichfield Cathedral seems to represent Saint Mary the Virgin, although the church in Offley is dedicated to Saint Mary Magdalene, not to the Virgin Mary. In the late 17th century, High Offley was associated with the Giffard family, a leading family of Staffordshire recusants. Robert Comberford (ca 1594-1671) of Comerford was the father of Mary Comberford (ca 1654/1655-ca 1683), who married ca 1680 Thomas Giffard of The Lodge, High Offley Park, son of Edward Giffard of High Offley and grandson of Peter Giffard (ca 1581-1663) of Chillington in Brewood. When Mary Giffard of Offley died ca 1683, her mother, Catherine Comberford, filed a renunciation in Lichfield of any interest in the estate of her daughter who had just died. 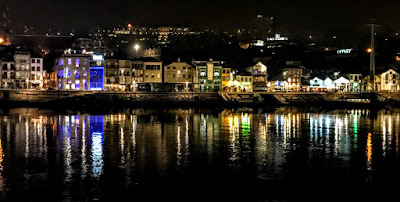 But none of these obscure connections with the Comberford family and with Lichfield Cathedral provided any explanation for the name of one of the famous English-founded Port lodges in Porto as I looked at the reflections on the Douro last night. It turns out that the Offley name in the English trade in Port dates back to William Offley, a wine merchant from London who founded the business in 1737. Offley was soon exporting wines and later began to produce his own Port wine. The brand quickly gained international recognition as one of the premium quality wines. A decisive moment in the development of the Offley brand came a century later with the arrival of Joseph James Forrester (1809-1861) as a partner in the company. He was a charismatic figure who later became known in Portugal as Baron de Forrester and he played a key role in expanding Offley and the Port wine industry in the 19th century. He arrived in Porto in 1831 to join his uncle, James Forrester, by then a partner in the house of Offley, Forrester and Webber. He then spent his entire adult life in Portugal devoted to Douro and Port wine. 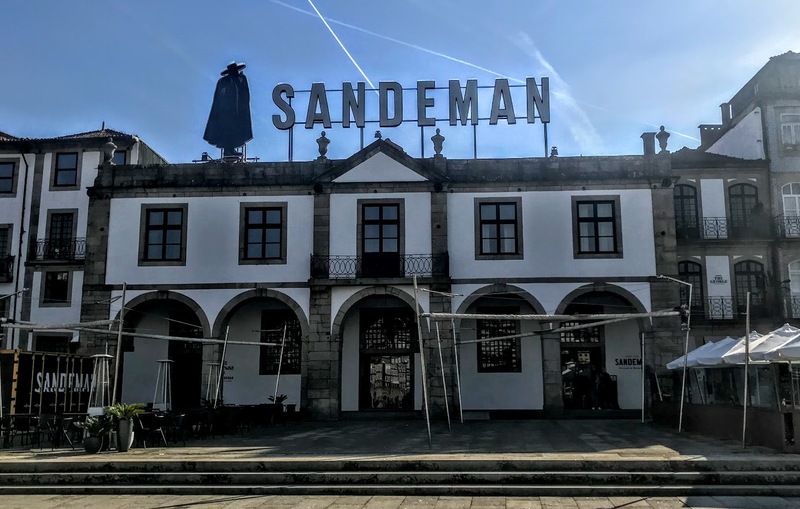 He contributed to the growth of Port wine’s international trade links, and he was the first person to chart the Douro River and Valley, an accomplishment that earned him recognition from many European geographical societies. 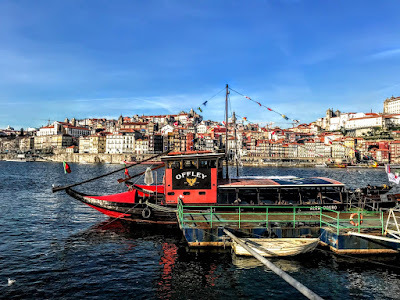 Over the years, Offley invested in the production of their wines, installed and replanted landmark vineyards, built and maintained their cellars in Vila Nova de Gaia and expanded the distribution of the brand. Forrester gave evidence before a select committee of the House of Commons on wine duties in 1852, and in 1855 he was named Baron de Forrester for life by King Ferdinand II of Portugal. So, it seems, the Offley house in Porto had no connections at all with High Offley in Staffordshire, with the Prebendaries of Offley in Lichfield Cathedral – or even with Mary Comberford of Lichfield who married into the Giffard family of High Offley. I suppose if I am going to find a family connection here I have to do a little more research on Nicholas Comerford, who became the first British consul in Porto in 1642, two years after the restoration of Portugal’s independence. But it all shows that for 300 years, 400 years, or even more trade has trumped borders when it comes to relations between Britain and Portugal, between Britain and Ireland, between Ireland and Portugal. We need to keep tearing down old borders in Europe rather than erecting new ones. In vino veritas. One of my few regrets about travelling with Ryanair in the past was not being able to take back a good bottle of wine in my overhead baggage. Indeed, I have mused about how pleasant it would have been to take back a good bottle of port from a Cambridge college cellar. Now all this has changed because Ryanair’s new checked-bag policy makes it easier to bring back a bottle of wine, or even two, in my suitcase. And who could come to Porto without wanting to bring back a bottle of Port? 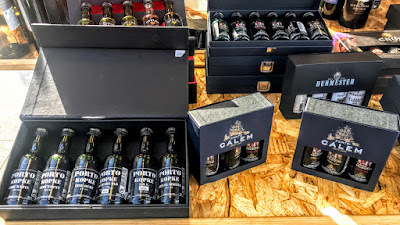 Walking down the hill from Porto Cathedral earlier this week, I decided to stop in a small shop selling varieties of port by the glass and the bottle, and serving it with dark chocolate, to learn a little more about Port. 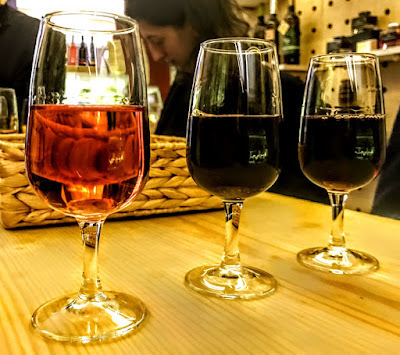 Port wine (vinho do Porto), or simply Port, is a fortified wine produced with distilled grape spirits exclusively in the Douro Valley in this part of Portugal. 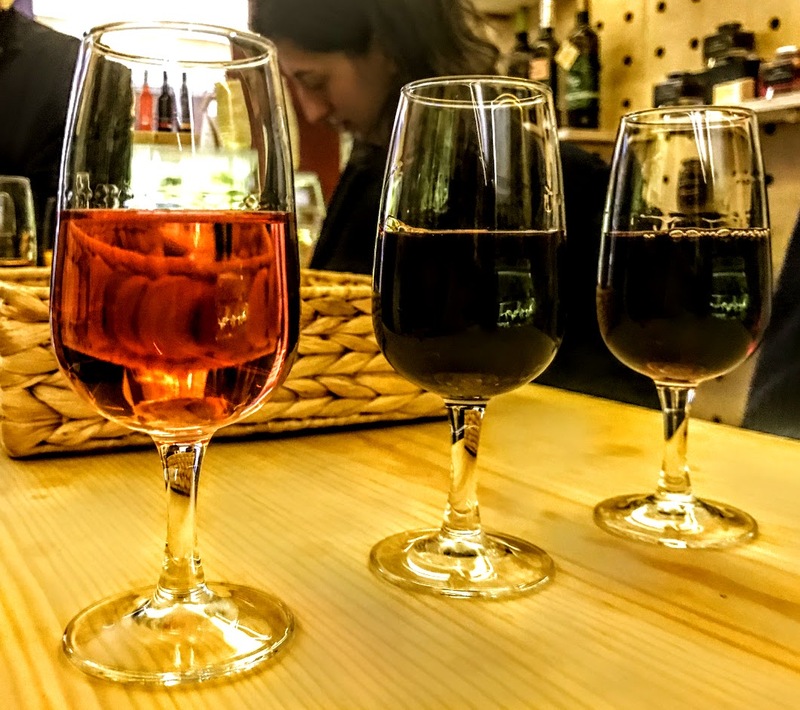 Port is typically a sweet, red wine, often served as a dessert wine, but it also comes in dry, semi-dry, and white varieties. Port is produced from grapes grown and processed in the demarcated Douro region. The wine is then fortified by the addition of a neutral grape spirit known as aguardente to stop fermentation, leaving residual sugar in the wine and boosting its alcohol content. The wine is then stored and aged, often in barrels stored in a ‘Lodge’ or ‘cellar,’ before being bottled. This wine became known as ‘port’ in the late 17th century because wine from the Douro Valley was brought to Porto for export to other parts of Europe. The Douro Valley stretches from the village of Barqueiros, about 70 km upstream from Porto, and east almost to the Spanish border. Over 100 varieties of grapes may be used in producing port, although only five are widely cultivated and used. White ports are produced the same way as red ports, but use white grapes, and all Ports commercially available are from a blend of different grapes. The grapes grown for port are usually small, dense fruit that produce concentrated, long-lasting flavours, suitable for long ageing. Until 1986, Port could only be exported from Portugal from Vila Nova de Gaia on south bank of the Douro, facing Porto. Traditionally, the wine was taken downriver in flat-bottomed boats, barcos rabelos, to be processed and stored. But this tradition was brought to an end when several hydroelectric power dams were built along the river in the 1950s and 1960s. Now the wine is brough from the vineyards by tanker trucks and today the barcos rabelos are only used for racing and other displays. The main categories of port include standard rubies, three-year-old tawnies and white ports. In English-speaking countries, Port is often served after meals as a dessert wine, often with cheese, nuts or chocolate. White and tawny ports are often served as aperitifs. A Liverpool wine merchant sent two new representatives to Viana do Castelo, north of Porto, in 1678 to learn the wine trade. When they arrived in the Douro Valley, they visited the Abbot of Lamego, who treated them to a ‘very agreeable, sweetish and extremely smooth’ wine that had been fortified with a distilled spirit. They were so pleased with the product that they bought up the Abbot’s entire lot and shipped it home. Port became popular in England after the Methuen Treaty in 1703, when merchants were permitted to import it at a low duty, while war with France deprived English wine drinkers of French wine. The continued British involvement in the port trade can be seen in the names of many Port shippers and brands, including Broadbent, Cockburn, Croft, Dow, Gould Campbell, Graham, Osborne, Offley, Sandeman, Taylor, and Warre. Shippers of Dutch and German origin are also prominent, such as Niepoort and Burmester. A few Port shippers and producers are also Portuguese, including Ferreira and Quinta do Crasto. The origin of the question is attributed to Henry Bathurst who was Bishop of Norwich in 1805-1837. He lived to the age of 93, but by then his eyesight was failing and he had a tendency to fall asleep at the table near the end of a meal. As result, he often failed to pass on the Port, so that several decanters would accumulate at his right elbow, to the distress of anyone further up the table. A bon vivant said to possess a prodigious capacity for wine consumption, he was sometimes suspected of using these frailties to his advantage. Other sources say the question originates with John Sheepshanks, Bishop of Norwich in 1893-1910, and Bishop Sheepshanks did his best to perpetuate this notion. His portrait, donated by his grand-daughter, hangs on the wall at Taylor’s Quinta de Vargellas as an encouragement to guests to pass the Port. I have two bottles of Port to bring back in my checked bags tomorrow.